The 22.50 Axis is the third and ultimate seal on the recent production signed by Mochi Craft with the joint collaboration of Nuvolari & Leonard. The overwhelming ascent of Mochi Craft occurred thanks to three very successful boats, which are similar to one another as for performance and elegance when at sea, yet different and almost perfect from the point of view of the comfort on board, both on deck as well as belowdecks. The most recent creation is called 22.50 Axis. We tested it on one of the most beautiful days that the Emerald Coast (Sardinia-Italy) has to offer. After the sea trials I convinced myself that knowing how to design and build a boat does not happen by chance. One of the first and most important features of this thoroughbred is its perfect trim when running. 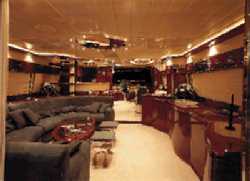 Its trim is excellent, elegant, low and spinning notwithstanding the boat's displacement of 50 or more tons. Outside space is interconnected according to logical movements and style. The aft deck has twin ladders that connect the helm station to the cockpit. The elegant and practical access doors in the cockpit and on the sides as well as the flying bridge are masterpieces of space ergonomics and good taste. Rational and well designed solutions apply to the bow area, to the two weathertight doors that connect the salon with the sidedecks, access to the engine room, the aft locker, access to the crew dinette and the service area, etc. Interiors feature very sober and refined finishing. 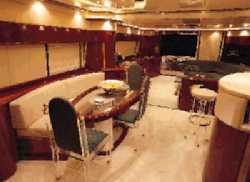 The idea of three staterooms and a service area is a very good solution. The heads are beautiful. The crew quarters are very roomy. The salon is on two levels: near the entrance there are the settees, further inside we find the dinette and the galley which is on the same level as the helm station. Third seal of approval on the successful Mochi 22.50 Axis for a yard that renovated itself and that guessed the product and its potential clients. Light displacement: 110,375 lbs. ; Full load displacement: 128,035 lbs. Total engines and reduction gears weight: 10,155 lbs. Obs. : a different accomodation plan is possible with four cabins instead of three (an extra cabin instead of the service cabin). 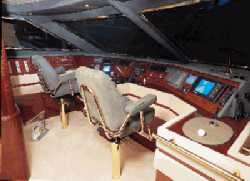 Description and characteristics of the flying bridge: twin access with ladder from the cockpit and inside ladder from the salon, windshield, helm station with controls, compass, wheel and engine controls, controls of bow thruster, flaps, winch and rudder angle indicator, 1 pilot's seat and two co-pilot's seats, table with locker/settee, cabinet and sink, bar and glass rack, roll bar, 2 watertight hi-fi stereo loudspeakers, sun deck, tender davits, 11'9" tender with 25 hp outboard engine. Galley: on one side of the salon, with two sinks, ceramic hobs, microwave/grill oven, 75-gallon refrigerator, dishwasher, trash-grinder, shelving, extractor fan, weathertight door to sidedeck. Standard fittings: aft locker with worktop, storeroom, freezer and direct access to crew dinette, 70,000-BTU air conditioning plant, 4 electric fans in engine room, fire-fighting electric pump in engine room, 2 16-kW generators, flaps, 32-gallon boiler, 2 8-passenger liferafts and 16 lifevests, weather station, bow thruster. Docking maneuverability: excellent. The boat is fitted with the necessary equipment and during docking it is very easy to move around. Electrical panel and plants: complete and very well fitted. too little space in the galley.